Tracksounds: New Site for Bear McCreary's Battlestar Galactica Orchestra Unveiled! 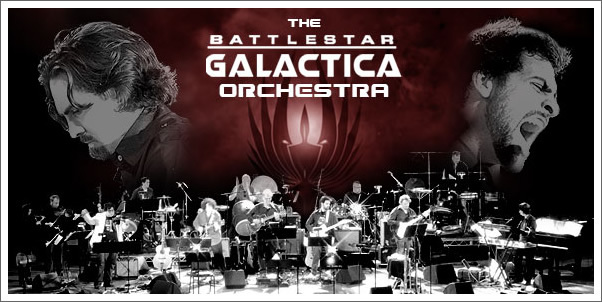 New Site for Bear McCreary's Battlestar Galactica Orchestra Unveiled! (July 16, 2009- Los Angeles, CA) – Norwegian web designer Arild W. Tvergrov was named the winner of the “Design the BSG Orchestra Website” contest by composer and orchestra founder Bear McCreary. The 23 year-old developer’s winning design can be viewed at www.bsgorchestra.com. Arild W. Tvergrov is a web designer and developer at the Centre for Development and the Environment, University of Oslo in Norway. His current web projects include Final Fantasy Norge (http://finalfantasy.no/), the largest Scandinavian Final Fantasy fansite, The Norwegian Latin America Research Network (http://www.norlarnet.uio.no/), Network for Asian Studies (http://www.asianettverket.no/url/forsiden/), and of course The Battlestar Galactica Orchestra Website. As part of the prize he has won, Tvergrov will be flown to San Diego for the July 23rd performance of The Music of Battlestar Galactica at the House of Blues as part of Comic Con. He will be given all access to the band’s sound check, and will be given Bear’s personal baton from that evening, a poster, and the Battlestar Galactica: Season 4 soundtrack all autographed by Bear and/or the members of the Battlestar Galactica Orchestra. Battlestar Galactica composer and Battlestar Galactica Orchestra founder Bear McCreary was recently called one of the top 10 composers “that make space adventures epic” by www.io9.com. His work on the television series Battlestar Galactica has been described as offering “some of the most innovative music on TV today,” by Variety, and his blog www.bearmccreary.com/blog, which features in-depth inside looks at the process of scoring Battlestar Galactica, was called "one of the best blogs in the business. It's a fascinating look at the process of making music for film and television and the care he takes with aligning the score with the twists and turns of each character's plot lines," by The Hollywood Reporter. McCreary announced the design contest on his blog on June 21, 2009. “I was thrilled with the quality of the submissions to our contest,” McCreary said. Because of that he decided to give a special limited edition signed CD to all of the contest entrants. “Arild's design is unique and captures the spirit of the BSG Orchestra,” explained McCreary. “Were it not for this web design contest, I would never have had the chance to witness the dedication and enthusiasm he brings to his projects. I greatly look forward to meeting him backstage in San Diego." To see the winning entry visit the Battlestar Galactica Orchestra’s new website at www.bsgorchestra.com.